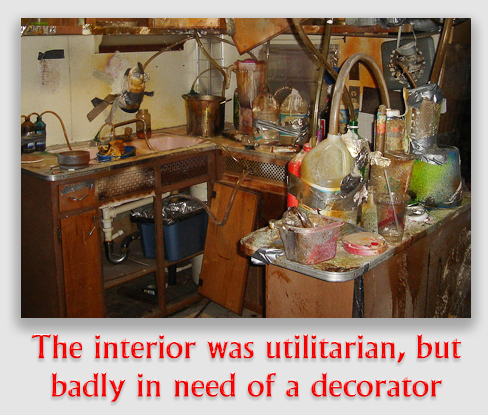 Posted on March 29, 2019 by treelawyer	tagged. 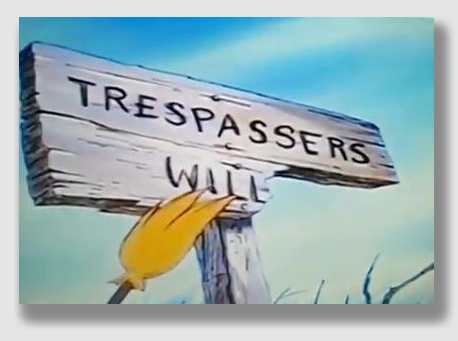 My first brush with the law of trespass came at the age of 5 or so, when I learned from a Bear of Little Brain that a sign in the Hundred-Acre Wood that said, “Trespassers Will-“ was really shorthand for “Trespassers William,” who had once lived there. Of course, as I now know, “Trespassers William” is an indie rock band. Growing up is no fun. 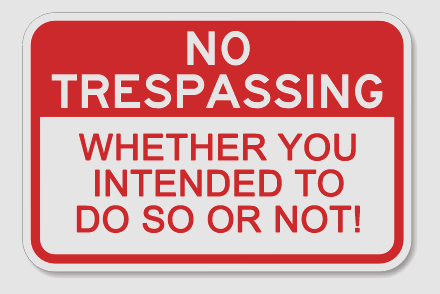 Since the time I was compelled to grow up, I have seen countless “no trespassing” signs on fencerows, on gates, freestanding by driveways and tacked to front doors. The signs always sort of troubled me. As everyone knows, a trespass is an unauthorized entry upon land of another even if no damage is done or injury is slight. To me, a sign prohibiting trespassing implied that absent the sign, trespassing was fine. If I cut across my neighbor’s yard to get to the new Dunkin’ Donuts before all the crullers are gone, I have trespassed whether there’s a sign or not, or whether I buy him some crullers or not. If he posts a sign along my increasingly well-worn path, does it gain him anything? The law, as always, provides us with an answer: maybe. 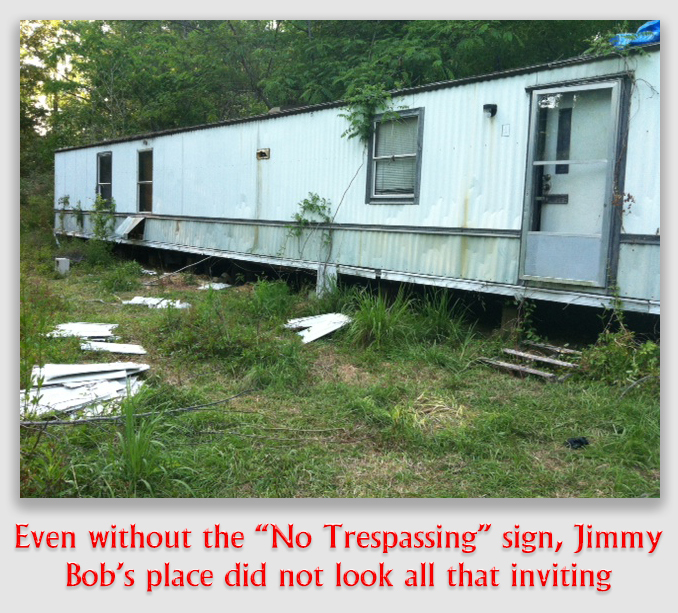 Jimmy Bob Christensen, sadly enough, came up on the wrong side of that “maybe.” Being a man who liked his privacy, Jimmy Bob posted “No Trespassing” signs at the far end of the 40-foot gravel driveway leading to his rather dilapidated mobile home. He liked being alone, for reasons that will become clear. One day, a couple of local police officers knocked on the door of Jimmy Bob’s neighbor, asking why she had bought out the local Kroger of pseudoephedrine. She said it was for Jimmy Bob, who was busy cooking it into methamphetamine. The police headed down Jimmy Bob’s driveway, past the “No Trespassing” signs, and knocked on his door. Apparently, manufacturing meth is an odiferous business, and the smell was distinctive. Although Jimmy Bob told them to vamoose and despite lacking a search warrant, the cops entered the mobile home and they found meth and guns. Generally, a driveway, a front sidewalk, even a door knocker or front doorbell, is enough to give any person with a legitimate reason your implied consent to walk up to the door and seek admission. If it’s someone you don’t want – an encyclopedia salesman or religious proselytizer, perhaps – you can withdraw the implied consent by telling them to leave. Sometimes, posting a sufficient warning is enough to withdraw your implied consent ahead of time. 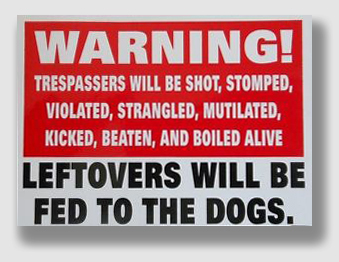 That’s the purpose of a “No Trespassing” sign. And that was surely what Jimmy Bob intended. If the police had heeded the sign, they never would have smelled the cooking meth. Jimmy Bob’s lawyer argued that they had trespassed, and that therefore the search was illegal (and nothing they found could be used as evidence). State v. Christensen, 517 S.W.3d 60 (Supreme Court of Tennessee, April 7, 2017): In August 2013, two law enforcement officers drove down James Christensen’s unobstructed driveway, past a “No Trespassing” sign, parked near his residence, and walked up to the front porch. After Christensen opened his door, the officers smelled the odor of methamphetamine being manufactured. They asked Christensen for consent to enter his residence, but he refused and closed the door. They forced the door, and inside the residence found an active methamphetamine lab and several guns. Prior to trial, the Defendant filed a motion to suppress evidence, claiming that the evidence had been seized as the result of an unlawful search because he had posted “No Trespassing” signs near his driveway. He asserted that the officers’ entry onto his property without a warrant violated the Constitution. After a hearing, the trial court denied the motion.